New York's Southern District Court -- which has been hosting (along with the Second Circuit Appeals Court) the ACLU and New York Times' long-running, concurrent FOIA lawsuits against the government over its drone killing memos -- has reached a partial decision on some of the embattled documents. The court's decision was actually delivered on Sept. 30th, but its conclusion and order have spent the last month under seal while the government applied its redactions. An accompanying memo from the presiding judge [pdf link] notes that the court isn't buying all the government's redaction arguments. 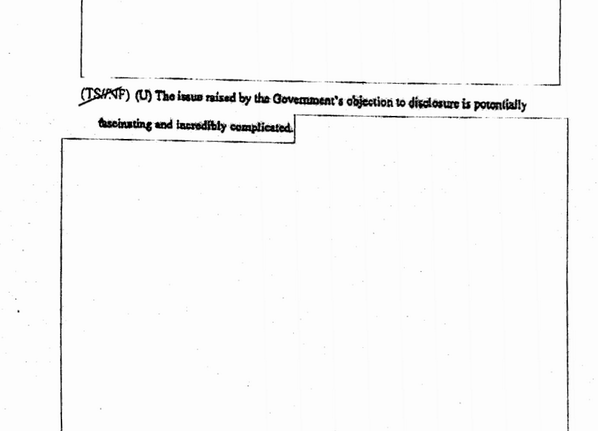 I disagree with the Government's redaction of the bulk of the first full paragraph and the second and third paragraphs on page 9, which as drafted by this court contain not a whit of classified material (the Government does not suggest otherwise), and which I do not believe would tend to reveal any classified information. In order to preserve that issue for appellate review, I will release on the public docket the opinion with all the Government's proposed redactions today, along with this cover note indicating my conclusion about this material. Should the Second Circuit agree with the Government that the material was properly redacted, nothing will be lost; should it agree with my view that nothing the Government has redacted on page 9 should be redacted, it will so indicate. Indeed, page 9 of the order [pdf link] leaves almost everything to the imagination, retaining only a single sentence that really makes you wish the court hadn't deferred to the government's judgement. The issue raised by the Government's objection to disclosure is potentially fascinating and incredibly complicated. if that be true, I see no reason why I am even going through this exercise. The court orders the government to release the contested documents (legal opinions from the DOJ's Office of Legal Counsel) discussed in the order (the remaining documents related to the FOIA requests will likely be discussed next year), noting there is "no just reason for delay" considering both the public's interest in these memos, as well as the fact that it has been more than three years since the documents were requested. So, another long-running FOIA lawsuit is showing a little return on investment. 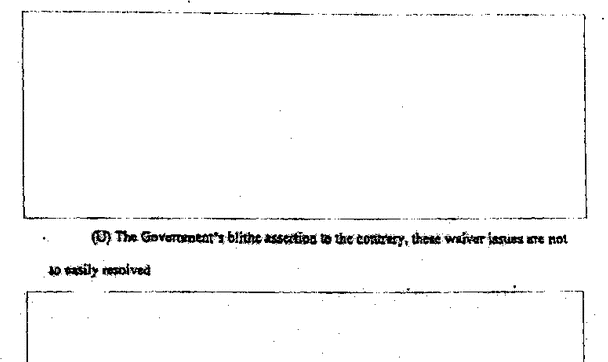 Unfortunately, the government's lengthy redactions prevent the public from seeing what arguments it's using in defense of its FOIA stiffarm, as well as keeping it from drawing any legal insight from the court's response. Well... all of that is still in the eye of the beholder. If corrupt people did not abuse their power so flagrantly then it would be a little bit more difficult to incite people to violence. And the statistics is not fair game for this because of the factors in involved. A dirty cop only needs to be dirty by virtue of protecting another dirty cop. A dirty cop does not actually have to abuse their authority to be dirty, all they need to do is turn a blind eye to those abusing. At the end of the day... you might sit in freedom and liberty because enough someones did vote with their bullets.